Beautiful Spacious Master Piece built by Starwood Builders. 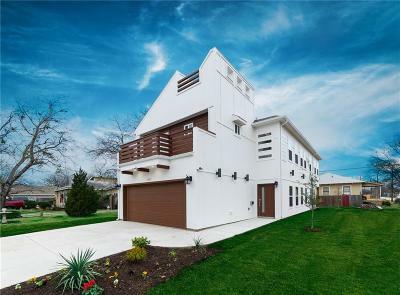 Modern, Contemporary Home loaded with upgrades.Two Master Beds.Upstairs Master has a Cedar balcony with views of Downtown Dallas.Mthr-in-Law Ste on 1st Flr has attached Full Bath, sliding dr and covrd patio. Dining Rm has a sliding dr with covered patio.10 exterior Sconce Lights. Recessed lighting everywhere! Granite kitchen with shaker style soft close wood cabinets.Crown molding, all baths have granite tops.12x24 Porcelain Tile in wet areas and balcony. Gorgeous flooring.2 Flush soft close toilets.Enjoy Trinity Groves Restaurants, Shopping, Proximity to Downtown Nite Life and Rapid Growth.~3miles to Downtown Incredible Price Point!